Gloriously imperfect and once seen never forgotten are two phrases which some up the enigma, Malcolm Holcombe. Whether listening to him live or a recording, a necessary adjustment is essential to tune into the music of surely one of the most distinctive performers from North Carolina to spread their message wide and far. 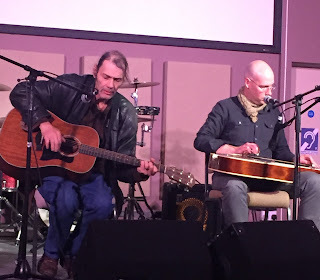 An imperative view of Malcolm Holcombe is to treasure his importance to the genre of American roots music and revel in the notion of one man flourishing with the utmost non-conformity. This successful promotion bringing a slice of Americana to a corner of north-west Worcestershire could once again reflect in an act of engaging diversity and leaving the folks of Bewdley with a lasting memory. For me this was a lengthy renewal after first seeing Malcolm play solo at the Kitchen Garden Café in Birmingham several years ago. 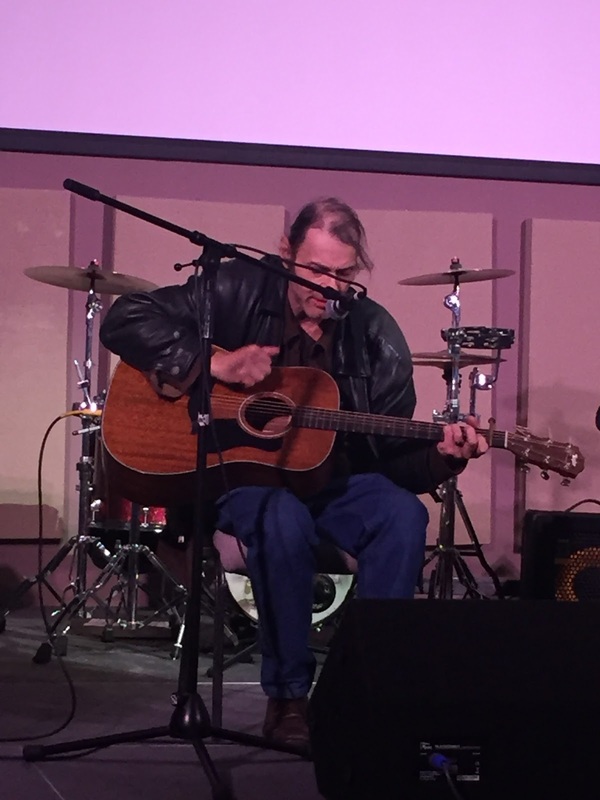 The vivid memory of a stool balancing – finger picking country blues guitarist has remained intact and the phenomena of this live performer is likewise in 2016. There were two main differences though: the chair rocking rarely surfaced and a rather useful slide guitar playing companion gave the overall music experience a more rounded glow. However still in place were the eccentric mannerisms, rambling stories and extraordinary ability to convey such inner soul drenched in a sound reminiscent of backwoods Appalachia. It was a perceived brave move to bring such a distinct left field artist to a community setting, but the three figure turnout was a tremendous sight in this challenging age for original live music. It was understandable that Malcolm may not have been to the taste of some people, yet the overall vibe in St. George’s Hall was positive. It was pleasing to witness so many live music fans being prepared to open their mind. 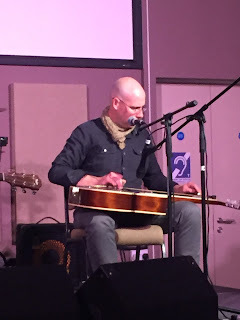 Jared Tyler was the slide guitar player joining Malcolm on this UK tour which had the added bonus of a brand new CD in tow under the title of ANOTHER BLACK HOLE. Not that you get Malcolm in exploitive PR mode, just an artist playing music he believes in and is formed by the prime experience of life. The quips and ramblings were delightfully alluring whether combining the honesty and sinister side to drink, washing dishes for a living or offering a humorous difference between a motel and a hotel. The mood was a flickering shade of darkness as the gloss of modern life was left on the shelf. The gruff vocal side of Malcolm Holcombe is an absolute understatement especially when compared to the occasional contribution from Jared. It is the perfect mode for the worn and weary style of his songs which demand total concentration, whilst rewarding such acts of dedication. In contrast to the depth of the song material, the music is a feast of simplicity with oodles of mighty picking filling the atmosphere. In line with their previous presentations, the promotion operating under the banner ‘Music in the Hall’ enlisted the services of two local acts to give the evening a sense of variety, while underpinning the essence of music development. An enterprising young blues duo Two Doors Down took to the stage for the first half hour to be soon followed by a more experienced blues rock band named One Tree Canyon. The latter act filled their set with a mixture of covers and originals. Inevitably ‘Wagon Wheel’ and ‘All Along the Watchtower’ assumed the role of standards, while a version of John Fullbright’s ‘Satan and St. Paul’ both intrigued and impressed. The turnout and subsequently successful venture of promoting this style of music in a market town not too far from a major urban area continues to defy general trends and this is a testimony to the promotion. 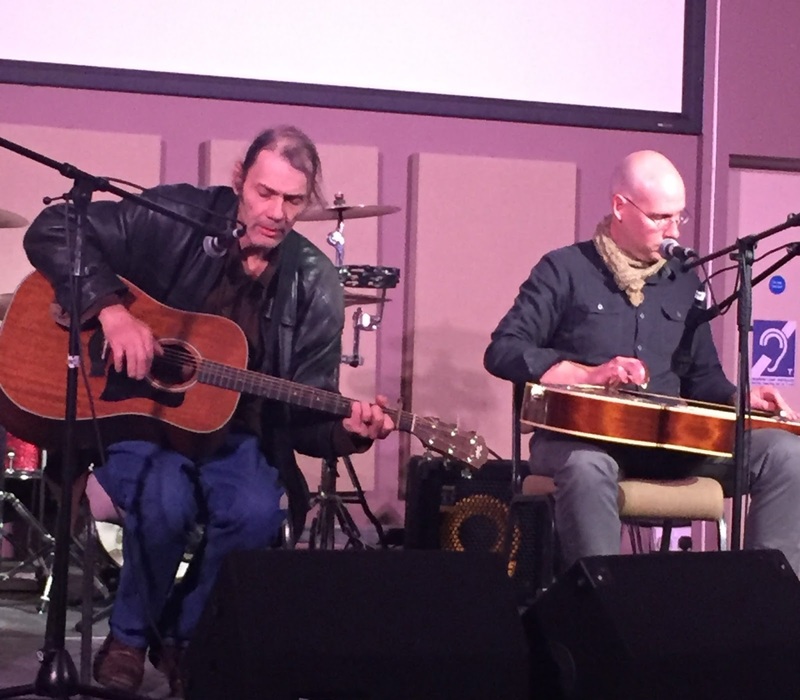 The booking of Malcolm Holcombe presented the opportunity for wider Midlands Americana music fans to catch up with this pure and authentic performer. The good news for the open minded is that Malcolm is in fine fettle, keeping his music true and honest, while ploughing an undeterred individual trail of ‘three chords and the truth’.